SIKES, Robert Lee Fulton, a Representative from Florida; born in Isabella, near Sylvester, Worth County, Ga., June 3, 1906; attended the public schools; B.S., University of Georgia, Athens, Ga., 1927; MS., University of Florida, Gainesville, Fla., 1929; engaged in the publishing business at Crestview, Fla., 1933-1946; served in the Florida state house of representatives, 1936-1940; elected as a Democrat to the Seventy-seventh and Seventy-eighth Congresses and served from January 3, 1941, until his resignation (January 3, 1941-October 19, 1944); United States Army during the Second World War, 1944; delegate, Interparliamentary Conference in Warsaw, 1959; elected to the Seventy-ninth and to the sixteen succeeding Congresses (January 3, 1945-January 3, 1979); reprimanded by the U.S. House of Representatives on July 29, 1976, for improper financial disclosure and conflict of interest; was not a candidate for reelection to the Ninety-sixth Congress in 1978; was a resident of Crestview, Fla., until his death on September 28, 1994; interment in Liveoak Park Memorial Cemetery, Crestview, Fla.
Papers: ca. 1940-1979, approximately 250 cubic feet. 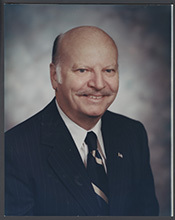 The papers of Robert Sikes contain correspondence and records, photographs, audiotapes, videotapes, and other materials covering his professional and personal life in Crestview, Florida after his retirement. Papers: In the Marion T. Gaines Papers, 1939-1975, 0.34 cubic foot. Persons represented include Bob Sikes. Papers: In the Leon Odell Griffith Papers, 1946-1981, 2.38 cubic feet. Persons represented include Bob Sikes. Papers: In the Thomas A. Johnson Papers, 1826-1975, 3.4 cubic feet. Persons represented include Bob Sikes. Papers: In the James F. Murray Papers, 1968-1977, 2.03 cubic feet. Persons represented include Bob Sikes. Papers: In the Pensacola Navy League Records, 1946-1983, 5.04 cubic feet. Persons represented include Bob Sikes. Papers: In the Retired Officers Association (U.S.). Pensacola Chapter, 1971-1985, 1.68 cubic feet. Persons represented include Bob Sikes. Papers: In the William D. Robertson Papers, 1933-1961, 2.25 cubic feet. Persons represented include Bob Sikes. Papers: In the Rosasco Family Papers, 1854-1976, 4.6 cubic feet. Persons represented include Bob Sikes. Ralph Nader Congress Project. Citizens Look at Congress: Robert L. F. Sikes, Democratic Representative from Florida. Washington, D. C.: Grossman Publishers, 1972.